Wed, Apr 24, 2019, 17:59:36 ---- The fact: 42.844.000 visitors done. Thermatool: Shanghai Zhong You Tian Bao CFD 1200 Start-Up Thermatool Corp.
Thermatool Corp. East Haven, CT, U.S.A. announces the successful start-up of a CFD 1200 (1200 KW output) Solid State Dual Contact and Induction Welder at Shanghai Zhong You Tian Bao Pipe & Tube Co. in Shanghai, China. The CFD 1200 welding unit is the first solid state welding unit installed on a 24 inch API and structural mill in China. It will produce pipe with an outside diameter range of from 219.1 mm (8.625) to 630.0 mm (24.863) with up to a maximum 19.1 mm (.751) wall thickness. 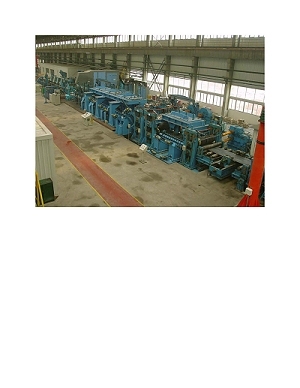 The pipe mill was provided by Milltech Co. Ltd. based in Taejon, Korea. The CFD 1200 Dual Welding unit is capable of welding with induction coils or contacts interchangeably, enabling the producer to realize the best advantages of each of these welding processes. This CFD 1200 welder is the first in a family of welders which are capable of operating at up to an 1800 KW output power level. In addition to the CFD 1200 welder, the mill line is also equipped with a 2,000 KW Thermatool Seam Annealing System made up of four 500 KW output 1 kHz units. A second Thermatool CFD 1200 Dual Welder and 2,000 KW Annealing System is in the process of being commissioned at another major API and structural pipe producer in China. For additional information on how Thermatools Solid State Welders and Annealing units can benefit you, please contact Thermatool Corp., 31 Commerce Street, East Haven, CT 06512. Tel: (203) 468-4100; Fax: (203) 468-4281; E-mail: info@ttool.com or Thermatool Europe Ltd., Thermatool House, Crockford Lane, Basingstoke, Hants, RG24 8NA, England, (Tel: +44 01256 335 533) or email to: info@ttool.co.uk. Thermatool is part of the Inductotherm Group, Rancocas, New Jersey, U.S.A.